BIO: Hi everyone, please say hello to Buffy. Buffy was found running loose early December 2018. She was a wet, cold, dirty, bedraggled mess. Upon being surrendered to us, and us taking her to the vet, we found out she was quite pregnant. From the way she looked, the vet felt she had already had more than a couple of litters previously. Buffy went into labor and was having such a hard time that she was taken to our vet to be put on whelp watch. On February 1st, 2019 Buffy gave birth to five puppies, of which only four survived. Buffy was such a fantastic Momma to her puppies. She is going to make a wonderful addition to the family of whoever is lucky enough to adopt her. She is so loving and attentive. She gets along fantastic with everyone and everything. The only thing we have noticed is that she is very cautious of anyone wearing a hat, male or female. Once the hat is off, she is more comfortable around the person. She loves to snuggle, play with her stuffed toys and just be around someone. Buffy was spayed, heartworm tested, microchipped (lifetime registration) and up dated on all of her vaccinations. When Buffy went in to be spayed we found out she had a heart murmur (stage 3) and some mammary masses. We had the masses removed and biopsied and they all came back benign. We, as well as the vets, highly suspect that poor little Buffy was a puppy mill dog. While she was sedated we had her teeth cleaned and polished and some teeth extracted that the vet felt needed to be removed. There shouldn’t be any problem regarding her heart murmur, but it is advised that if she ever has to have anesthesia, that your vet be advised of the situation. After everything this little munchkin has gone through, she bounced back like a little trooper. If you are interested in giving Buffy the wonderful, loving, forever home that she is so deserving of, please fill out and submit an application. You must have a completely fenced and secure yard in order to adopt Buffy. We will be doing vet checks, home visits and meet & greets prior to any adoption. Buffy is currently being fostered in Imlay City, MI., and will be available mid-April of 2019. Buffy gets along fine with other dogs and appears to be cat friendly/tolerant. We would really like to see Buffy go to a home with no other animals because we really feel she deserves to be loved and cherished and not have to share the attention with another animal. Buffy is so happy-go-lucky, as you can tell from her pictures. She is always smiling and in a good mood. You couldn’t possibly resist her charm and personality once you have met her. **UPDATE; Buffy has gone international!! Buffy was adopted d4/17/19 by a fantastic family in Sarnia, Ontario, Canada. Such a perfect day and such a perfect adoption. Buffy was all hugs and kisses because the home she has been so patiently waiting for was found. Buffy has adjusted to her new home and is getting along great with her new brother, Buddy. BIO: Please meet one of Buffy’s puppies, Cash. He is the only male that Buffy had that looks just like his Momma. The red under his eyes is just “tear staining” due to the dye in the puppy food. Cash, as well as his siblings will not be available for adoption until mid-April 2019. Cash is currently the largest of the four puppies, but the others are catching up quickly. Cash loves to wrestle and play with his other siblings and with small stuffed toys. These pictures were taken at 4.5 weeks and will be updated closer to adoption day. All of Buffy’s puppies will be vaccinated (age appropriately), micro-chipped (with lifetime registration}, wormed and vet checked prior to adoption. You must have a completely fenced and secure yard in order to adopt him. You will be required to sign a spay/neuter agreement prior to adoption. Because all of the puppies are so small and will not be that big when full grown, we cannot consider families with real young children. We are looking for homes and families that are willing to make a life-long commitment to the proper raising and socializing of these puppies. They will need a “stay at home” Mom or Dad in order to do this. Puppies are like children – you only get out of them what you are willing to put into them. We will be doing vet checks, home visits and meet & greets prior to any adoption. They are currently being fostered in Almont, MI. **UPDATE: Cash (renamed “Johnny” Cash) was adopted 3/30/19 by a wonderful family in Lexington, MI. Cash will be joining his new brothers: Jimmy (Chihuahua) and Beezer (Yorkie), so he will have playmates to keep him company. They are planning on taking Cash to senior citizen homes to spread some puppy love and brighten their spirits and days. BIO: Hi everyone, my name is Maggie. I was surrendered to SCBR along with my companion, Zoe, because my elderly parents could no longer take care of us. I am a very friendly little girl once given the opportunity to warm up to you. I am UTD on all vaccinations, heartworm negative, house/crate & paper trained and microchipped with lifetime registration. I get along with other dogs, cats, children and adults. I am a little skittish and will cower and react to quick or unexpected movements and loud noises. Because of that I would be best suited in a quiet family without small children. I do love attention and to be held, but do not do well with rough-housing. I ride well in a car and walk well on a leash. So, if you are looking for a fairly laid back companion to hold, snuggle and love – I could just be your girl. The top picture is when I first came in, the bottom is after I was cleaned up a little. I am being fostered in Imlay City, MI. You must have a completely fenced and secure yard in order to adopt me. **UPDATE: Maggie was adopted 1/26/19 by a very loving family in Southfield, MI. It was love at first sight. BIO: Please meet one of Buffy’s puppies, Mayhem. The red under his eyes is just “tear staining” due to the dye in the puppy food. Mayhem, as well as his siblings will not be available for adoption until mid-April 2019. Mayhem is just a tad smaller than his other two brothers but is catching up quickly. Mayhem loves to wrestle and play with his other siblings and with small stuffed toys. These pictures were taken at 4.5 weeks and will be updated closer to adoption day. All of Buffy’s puppies will be vaccinated (age appropriately), micro-chipped (with lifetime registration}, wormed and vet checked prior to adoption. You must have a completely fenced and secure yard in order to adopt him. You will be required to sign a spay/neuter agreement prior to adoption. Because all of the puppies are so small and will not be that big when full grown, we cannot consider families with real young children. We are looking for homes and families that are willing to make a life-long commitment to the proper raising and socializing of these puppies. They will need a “stay at home” Mom or Dad in order to do this. Puppies are like children – you only get out of them what you are willing to put into them. We will be doing vet checks, home visits and meet & greets prior to any adoption. They are currently being fostered in Almont, MI. **UPDATE: Murphy (formerly Mayhem) was adopted 3/30/19 by a very loving family in W. Bloomfield, MI. 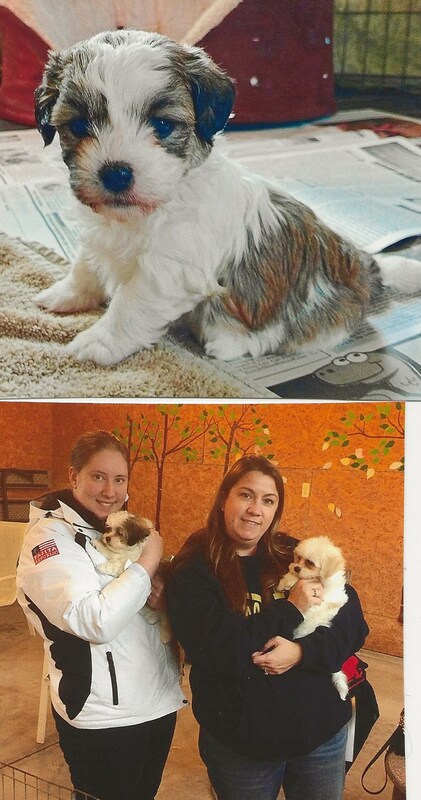 They not only adopted Murphy, but also adopted his sister Willow at the same time. It will be so nice for them to grow up together and to keep each other company. BIO: Please meet one of Buffy’s puppies, Reese. The red under his eyes is just “tear staining” due to the dye in the puppy food. Reese, as well as his siblings will not be available for adoption until mid-April 2019. Reese is just a tad smaller than his brother Cash but is catching up quickly. Reese loves to wrestle and play with his other siblings and with small stuffed toys. These pictures were taken at 4.5 weeks and will be updated closer to adoption day. All of Buffy’s puppies will be vaccinated (age appropriately), microchipped (with lifetime registration}, wormed and vet checked prior to adoption. You must have a completely fenced and secure yard in order to adopt him. You will be required to sign a spay/neuter agreement prior to adoption. Because all of the puppies are so small and will not be that big when full grown, we cannot consider families with real young children. We are looking for homes and families that are willing to make a life-long commitment to the proper raising and socializing of these puppies. They will need a “stay at home” Mom or Dad in order to do this. Puppies are like children – you only get out of them what you are willing to put into them. We will be doing vet checks, home visits and meet & greets prior to any adoption. They are currently being fostered in Almont, MI. 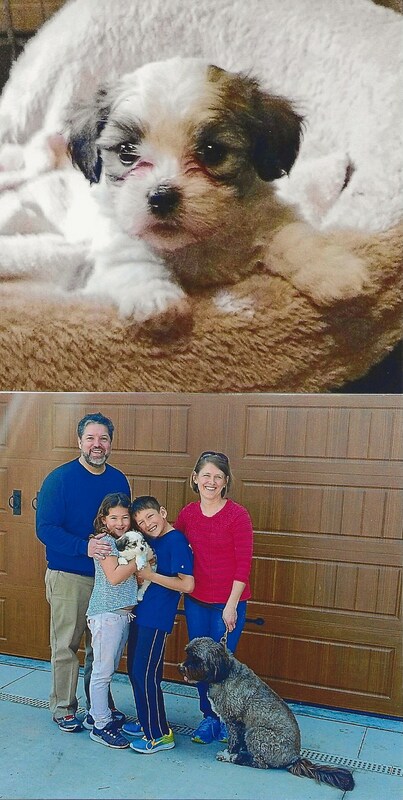 **UPDATE: Reese was adopted 4/6/19 by a wonderful family in Grosse Pointe Farms, MI. He not only will have children to play with, but also a PWD mix named Ginger to teach him the ropes. BIO: Please meet one of Buffy’s puppies, Willow. She is the only female that Buffy had, and she looks just like her Momma. The red under her eyes is just “tear staining” due to the dye in the puppy food. Willow, as well as her siblings will quickly. Willow is perfectly happy crawling up on your lap and going to sleep. She does like playing with her brothers and with small stuffed toys. These pictures were taken at 4.5 weeks and will be updated closer to adoption day. All of Buffy’s puppies will be vaccinated (age appropriately), micro-chipped (with lifetime registration}, wormed and vet checked prior to adoption. You must have a completely fenced and secure yard in order to adopt her. You will be required to sign a spay/neuter agreement prior to adoption. Because all of the puppies are so small and will not be that big when full grown, we cannot consider families with real young children. We are looking for homes and families that are willing to make a life-long commitment to the proper raising and socializing of these puppies. They will need a “stay at home” Mom or Dad in order to do this. Puppies are like children – you only get out of them what you are willing to put into them. We will be doing vet checks, home visits and meet & greets prior to any adoption. They are currently being fostered in Almont, MI.. Willow will not be available for adoption until mid-April 2019. Willow is the smallest of the four puppies, but is catching up quickly. **UPDATE: Willow was adopted 3/30/19 by a very loving family in W. Bloomfield, MI. 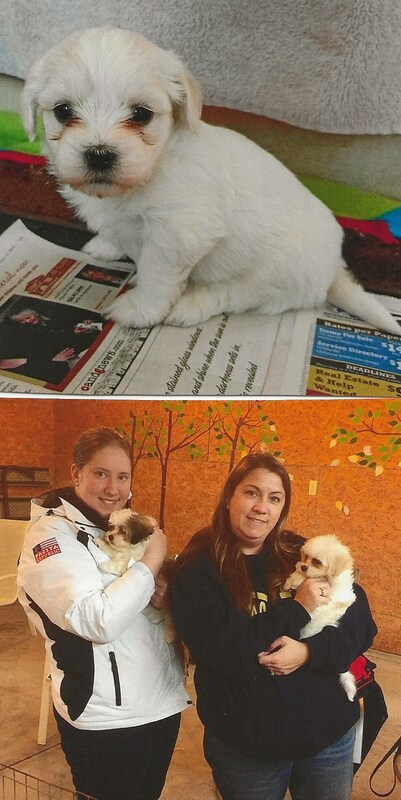 They not only adopted Willow, but also adopted her brother Murphy (formerly Mayhem) at the same time. It will be so nice for them to grow up together and to keep each other company. BIO: Hi everyone, my name is Zoe. I was surrendered to SCBR along with my companion, Maggie, because my elderly parents could no longer take care of us. I am just the friendliest little girl you could ever hope to meet. I am UTD on all vaccinations, heartworm negative, house/crate & paper trained and microchipped with lifetime registration. I get along great with other dogs, cats, children, adults – you name it. I am a definite Velcro dog and want to be with you 24/7 no matter what you are doing. I am full of energy, but love to snuggle. I ride well in a car and walk well on a leash. I am being fostered in Imlay City, MI. **UPDATE: Zoe was adopted 1/18/19 by a repeat offender from Plainfield, IN. They have always adopted Bouviers from us, but decided to downsize. They just recently had to say goodbye to their beloved Tobey but there was an emptiness that had to be filled. We couldn’t have been happier for Zoe to be adopted by this wonderful, loving couple.